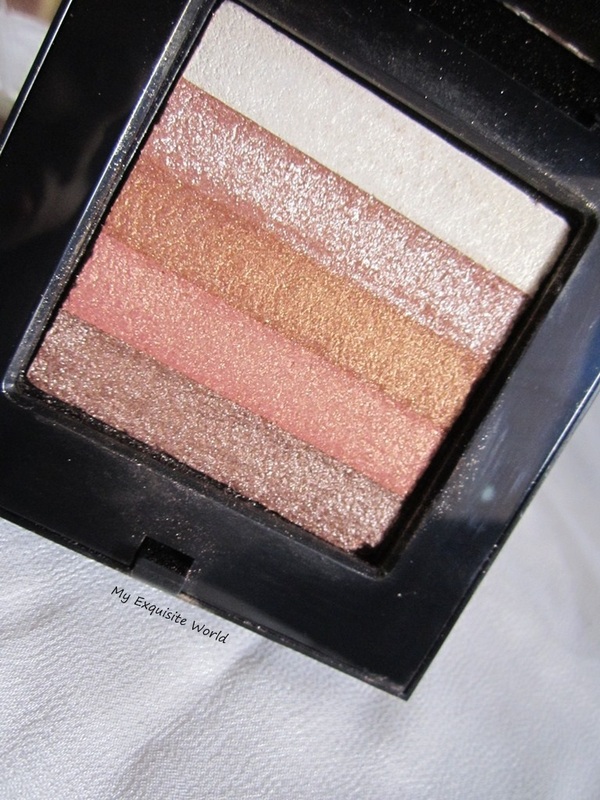 I loved my Bobbi Brown shimmer brick in bronze because of its versatility and the shades that it offers.I can use it as a blusher,highlighter,eyeshadow. 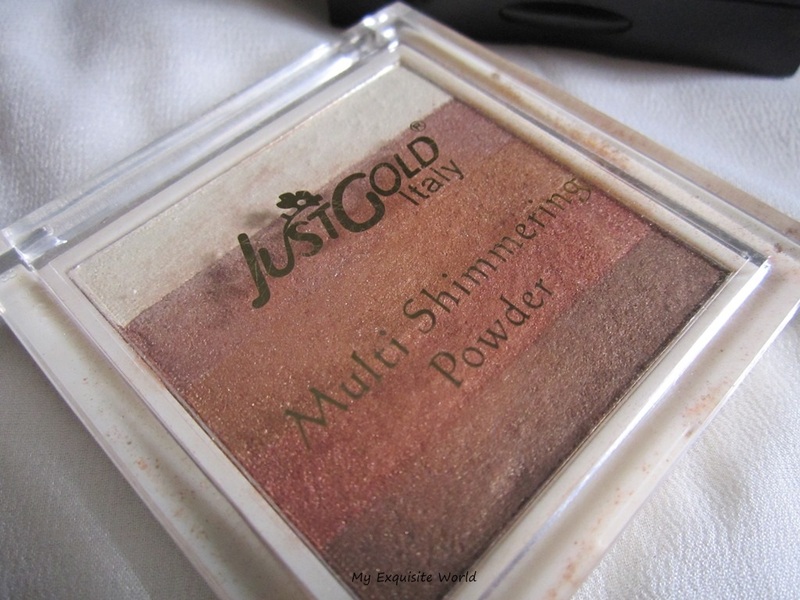 Once i was a Cosmetic shop and chanced to see this gorgeous beauty-Just Gold multi shimmer powder.The lady there told me that it can be used in many ways-just the way Bobbi brown shimmer brick can be used and I could not resist buying it for the fact that I love such products and this one is so affordable. PACKAGING: The packaging is simple and somewhat dull.A square body with a transparent lid.It is easy to locate and travel friendly but i think it might break if fallen!! !The shade number is provided at the back.It had two other varients-one was pink tones and one was somewhat mauve toned. SHADE: There are 5 shades in this. 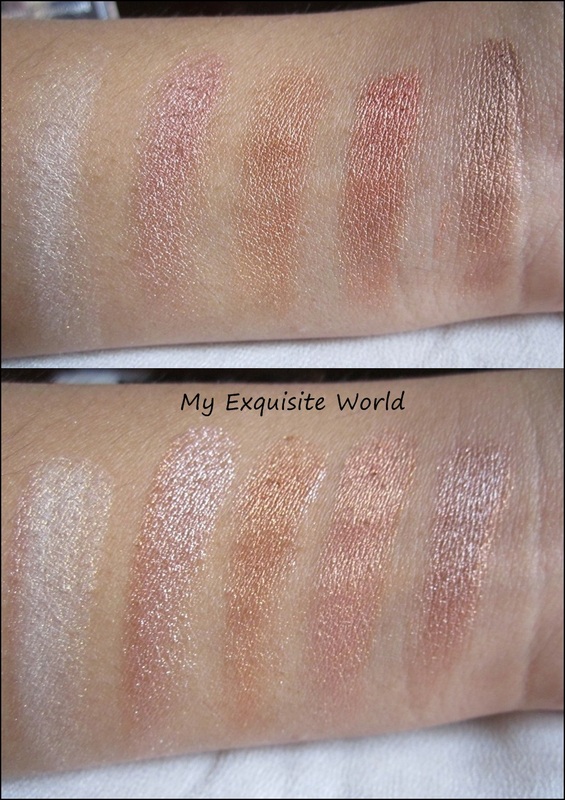 The lightest one is champagne gold that is great for highlighting. 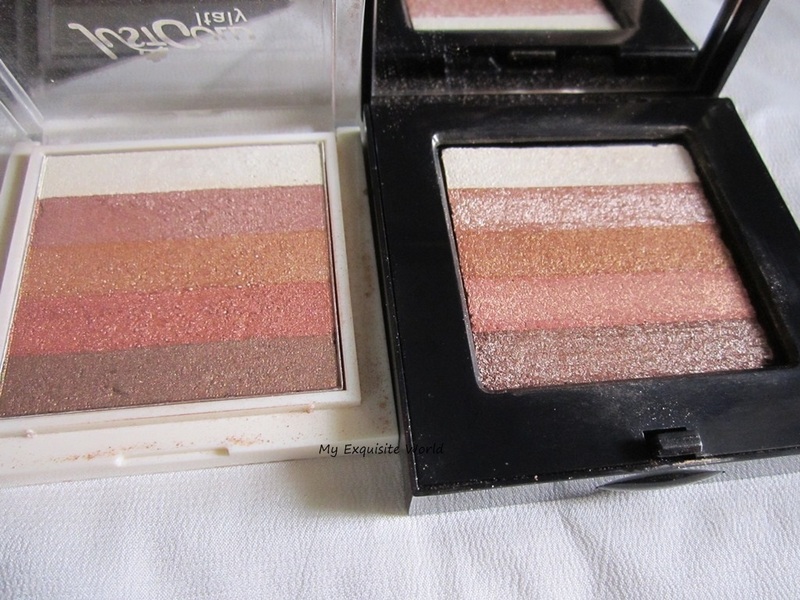 The same shades are present in the Shimmer brick as well. 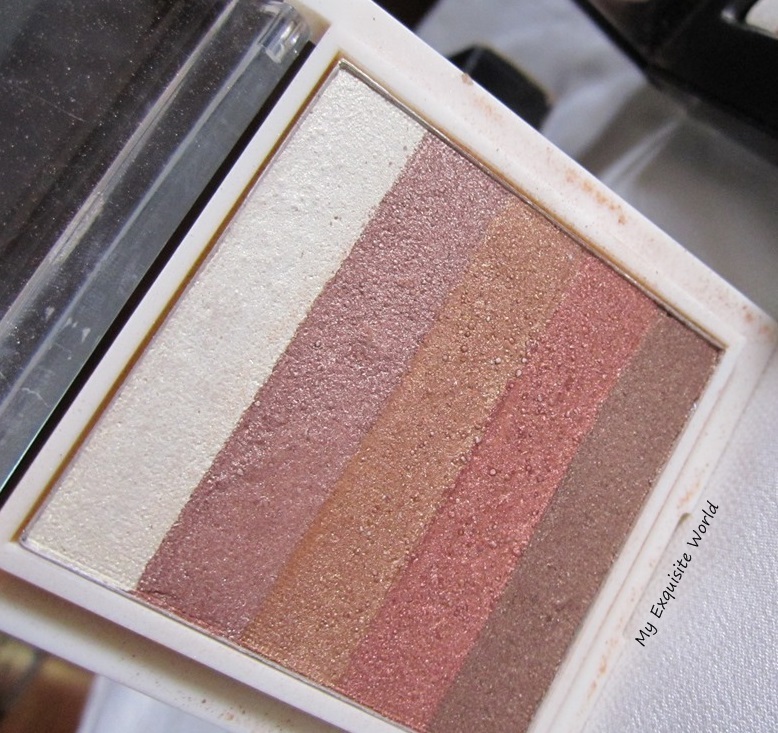 OVERALL PERFORMANCE: I must admit,I use this over Bobbi Brown one.The texture is soft and fallout is minimal. 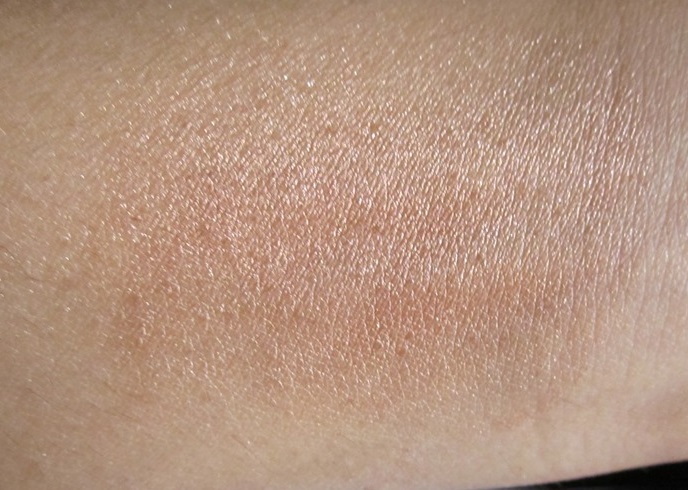 The shades are decently pigmented and when swiped together,a pink brown shade is formed which looks great. I have used them separately as eyeshadow also and they are easy to use.On a base,they look much better and the shimmer is more settled. 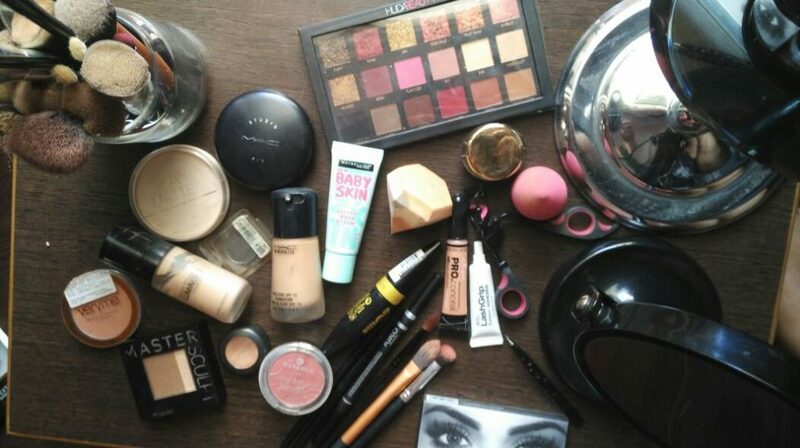 Staying power is around 5-6 hours which is great.It did not clog my pores neither irritate on skin. 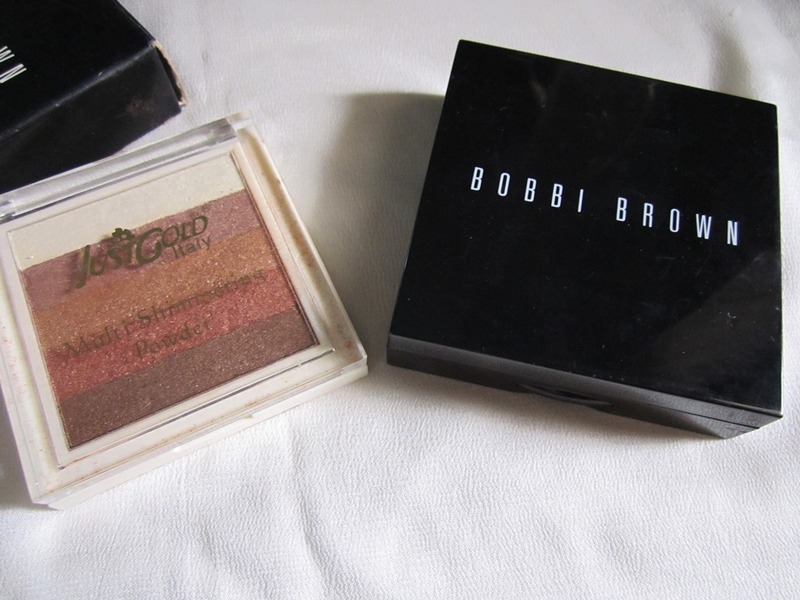 The Bobbi Brown shimmer brick is slightly more pigmented that Just Gold. 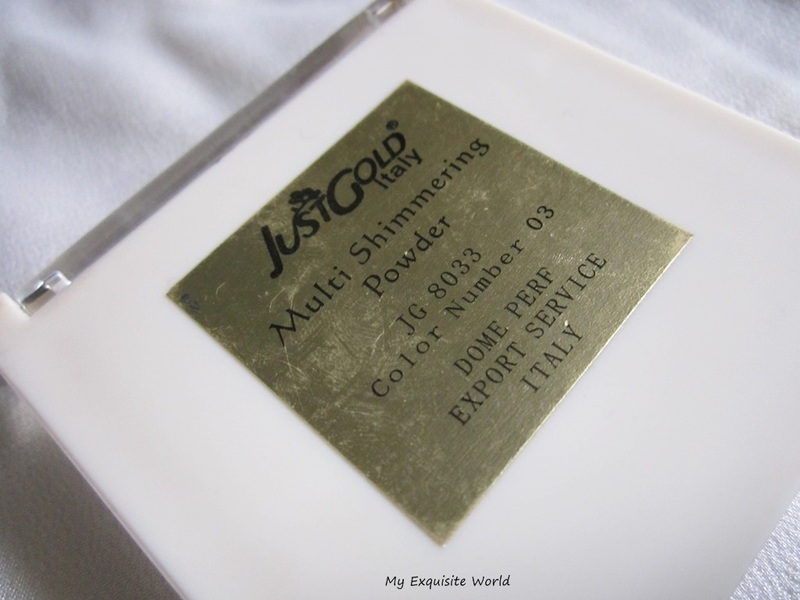 Just gold shimmer powder has almost negligible fallout but shimmer brick has . staying power is almost the same. The shades,when swirled together come out to be more deeper ,more bronze in bobbi brown than in Just gold. The shades appear as a bronzer in shimmer brick when swirled together whereas they come out as a subtle blush in Just Gold. The packaging of Bobbi Brown is decent and has a mirror too. Both can be used a s an eyeshadow. Just gold costs rs.500(around 10-12$$) whereas Shimmer brick costs around rs.220042$.!!!! 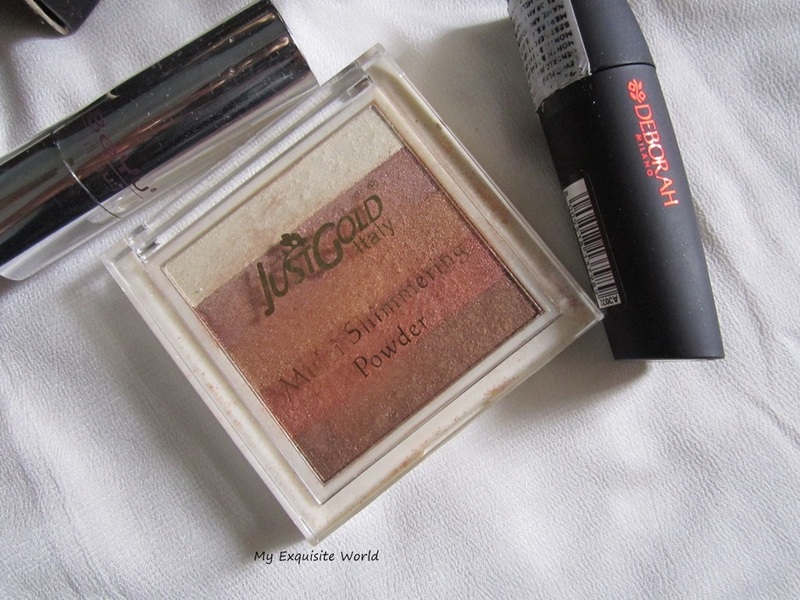 just gold isn’t easily available and Bobbi brown shimmer brick can be purchased online! 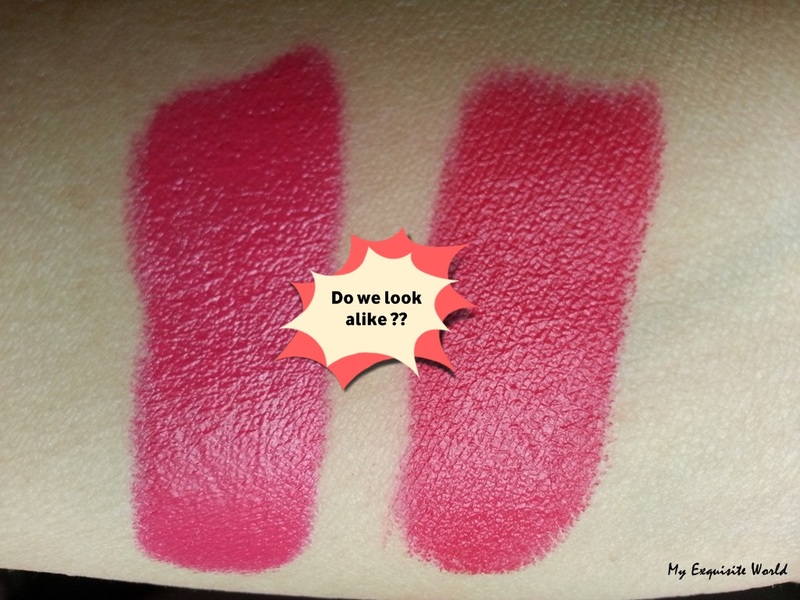 If you follow My Exquisite World regularly then you must have seen this post where i had shared 2 fuchsia lipsticks from different brands that are almost look alike!!! 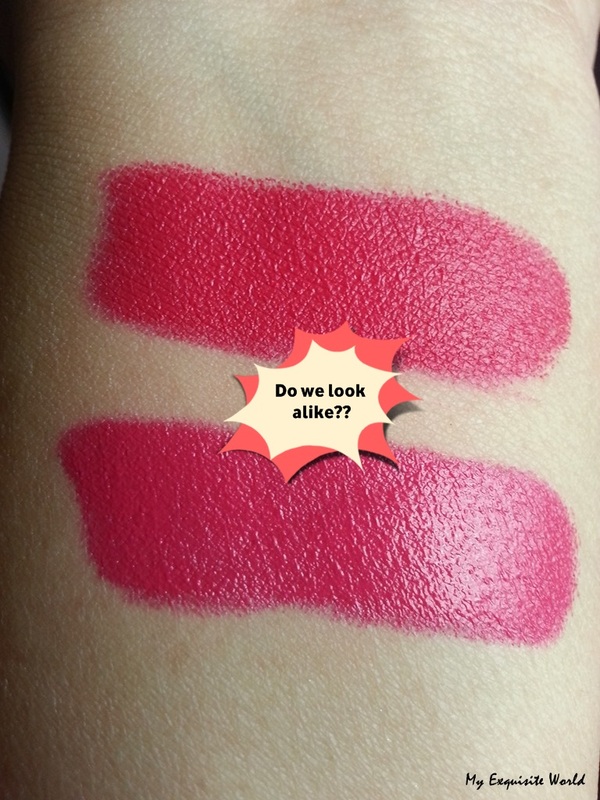 One is Lakme’ enrich satins shade 149(review here) and the other is Rimmel Colour Show off lipstick-Shocking Pink(review here)!! 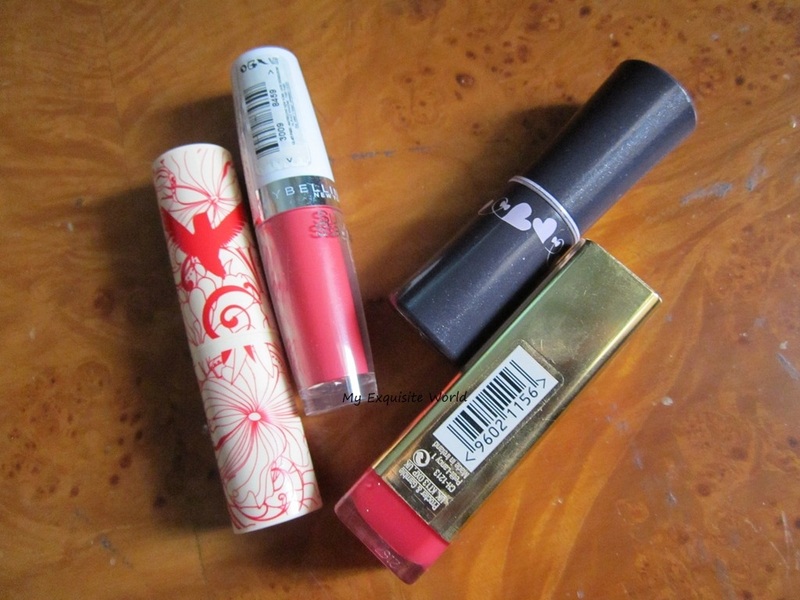 Lakme one is satiny matte and rimmel ne is matte. Lakme 149 is available at rs.225 while rimmel is available for rs.415. Lakme has a dull packaging while rimmel has very cute pink packaging. Both leave stain on lips. both have great staying power. both accentuate dry flaky skin and settle in the lip lines. So,which one will you pick??? 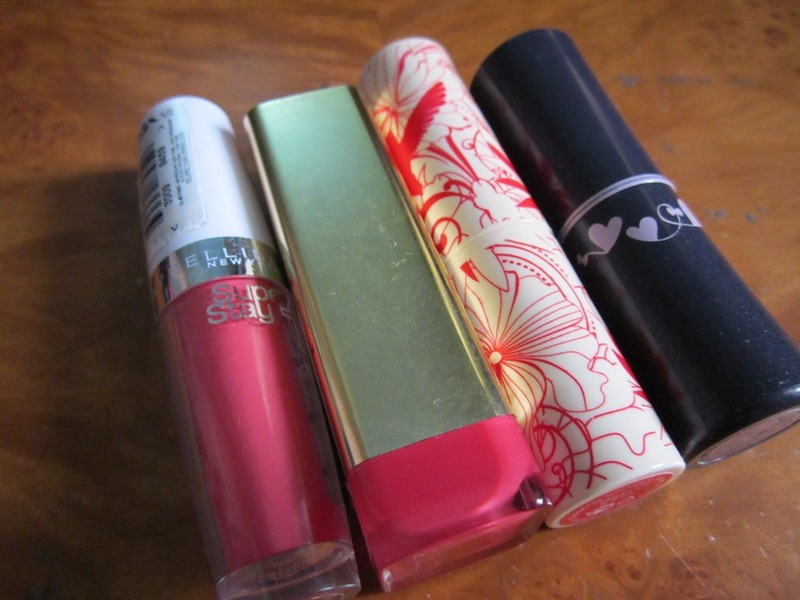 4 vivid coral lipsticks…which one will you pick?? So,here I am with my 4 best picks if you are looking for a vivid coral pink.I adore this shade and wear it quite often. 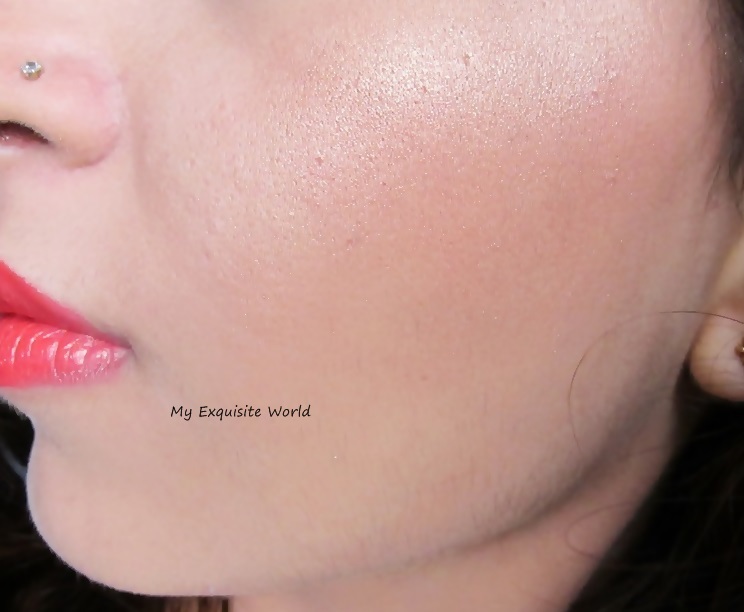 Maybelline 14hr super stay lipstick -Stay with me coral(430). 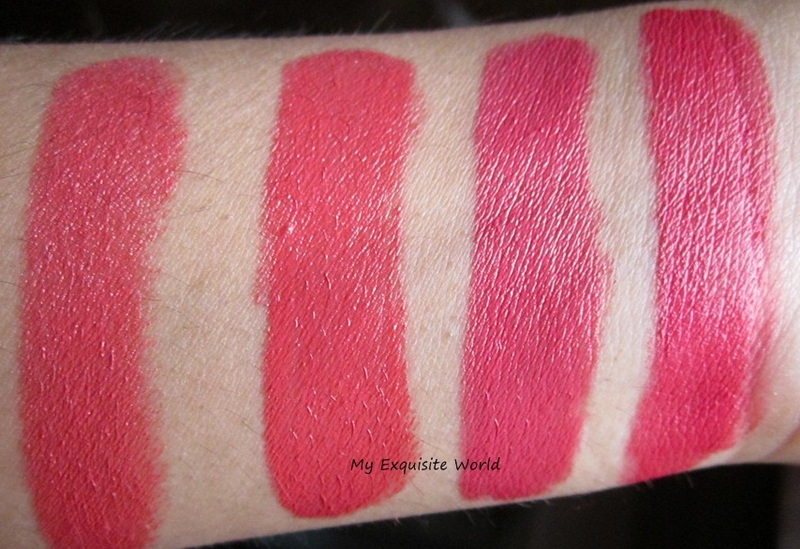 Max Factor color elixir lipstick 827(bewitching coral). 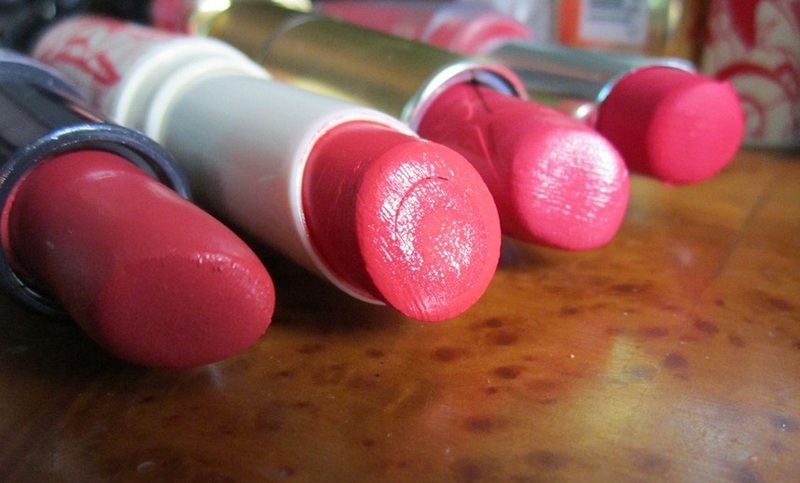 Oriflame beauty triple core lipstick-catwalk red. Avon simple pretty lipstick-Rosy Kiss. 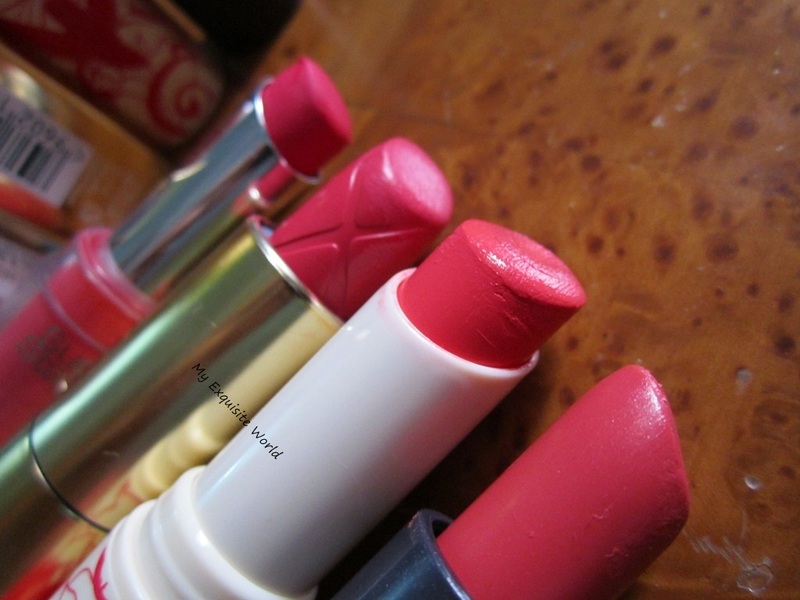 L-R:avon rosy kiss,oriflame catwalk red,max factor bewitching coral,maybelline stay with me coral. 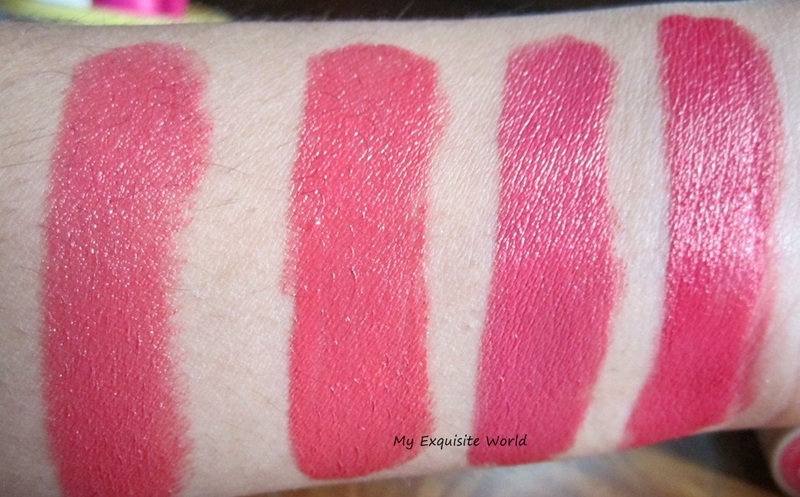 ~Maybelline stay with me coral is out an out a statement lipcoor.It goes matte and stays for a longe time.The shade is very similar to max factor bewitching coral. (Price is rs.525). 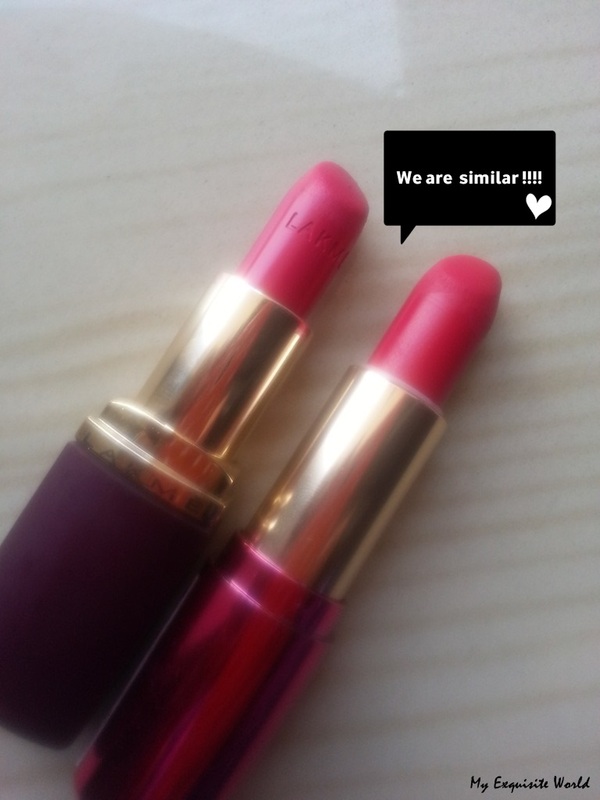 like me like you..<3 <3 Dupe Alert..
So,fuchsia shade is taking rounds everywhere and becoming a Hot shade this summers!! Can you guess which one of the following is 149 and which one is the other shade??? ?